Preheat the waffle iron or a normal frying pan. Add the eggs, milk, mustard, salt and pepper to a mixing bowl and whisk together. Keep aside. Place four slices of bread next to each other and spread 125ml (½c) pulled pork on each slice. Top each slice with 60ml (¼c) of the cheese and sprinkle with chives. Lightly brush the waffle iron or frying pan with olive oil and add the sandwiches. In a small mixing bowl, add all the ingredients and mix well to combine. 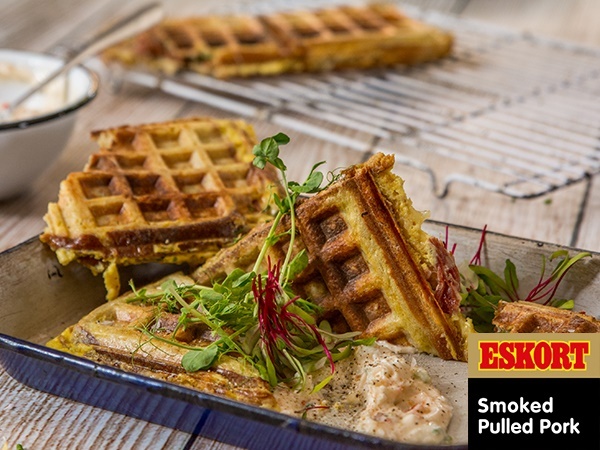 Place each waffle in a lunch box, add a dollop of the dip alongside it and garnish with microgreens.